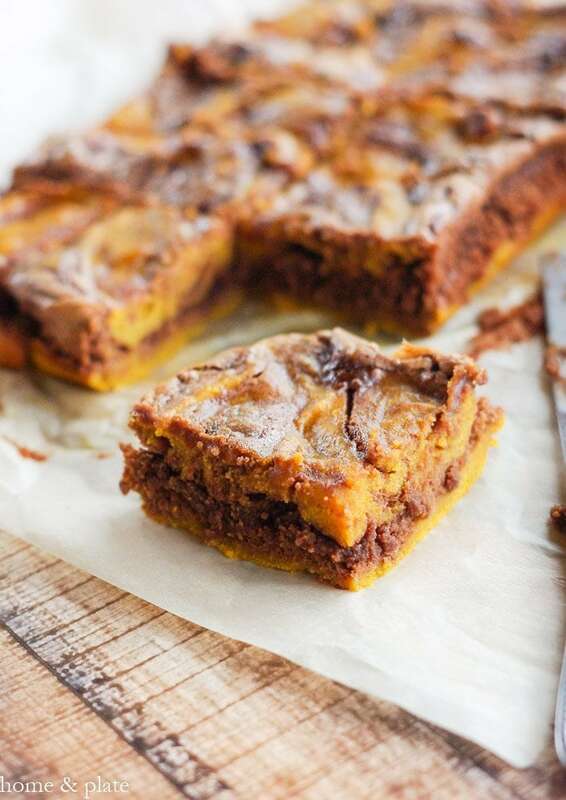 These marbled pumpkin chocolate brownies are swirled with two fall favorites – chocolate and pumpkin for an irresistible treat. Transform a box of chocolate brownie mix into a decadent fall dessert by adding sweet canned pumpkin. These marbled pumpkin chocolate brownies will disappear quickly. I promise! 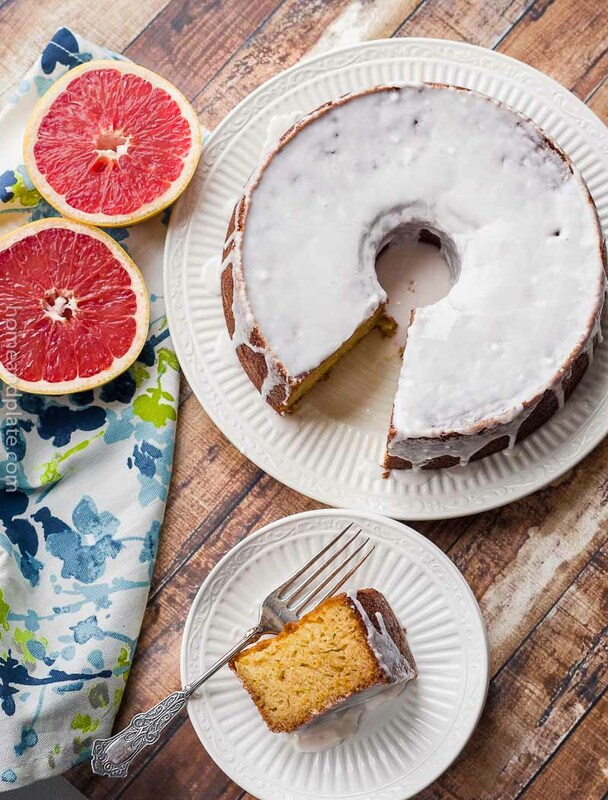 Moist and sweet with the perfect cake-like texture, these sweet treats are a great way to celebrate fall. And you will need a full glass of milk to go along with these babies. I made these brownies for a swim team social event. I wanted to contribute a dessert that was different from what other parents were bringing but one that kids would reach for. They were a hit. Every single one – gone. I wanted a pumpkin chocolate brownie that didn’t taste like cheesecake. I wanted my batter to be more of a cake-like consistency. Easy enough. All the ingredients I needed were already in the pantry and fridge. All I needed was a can of pumpkin. I layered the two batters in a baking pan and created a marbled effect using a knife to cut through the batter. 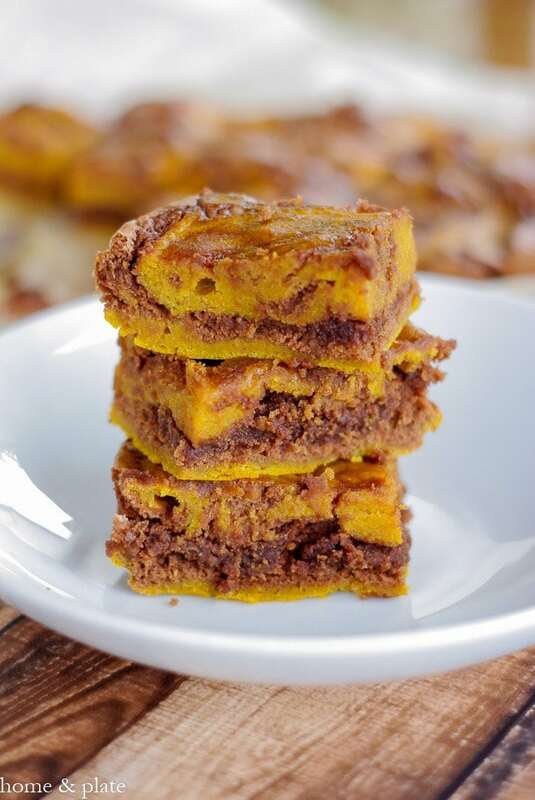 Delicious on their own or with a scoop of vanilla ice cream, these pumpkin chocolate brownies will become a fan favorite. 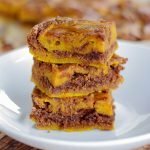 These marbled pumpkin chocolate brownies are swirled with two fall favorites - chocolate and pumpkin for an irresistible treat. Prepare the box of chocolate brownie mix according to package directions. Set aside the batter. In a separate bowl mix together the flour, sugar, pumpkin, baking powder, eggs, cinnamon, nutmeg and vanilla. Line a 13 x 9 baking dish with parchment paper or aluminum foil. Pour half of the pumpkin mixture onto the bottom of the dish spreading evenly to all corners. Then pour the chocolate brownie mix on top using a spatula to spread the brownie mix evenly and carefully. Finally add the remaining pumpkin batter on top and use a knife to combine the batters together to create a pretty swirled pattern. Allow the brownies to bake for 45-55 minutes or until a toothpick inserted into the center comes out almost clean. Allow the brownies to cool completely. Lift the brownies out of the pan via the foil or parchment paper. Cut the brownies using short sawing motions. 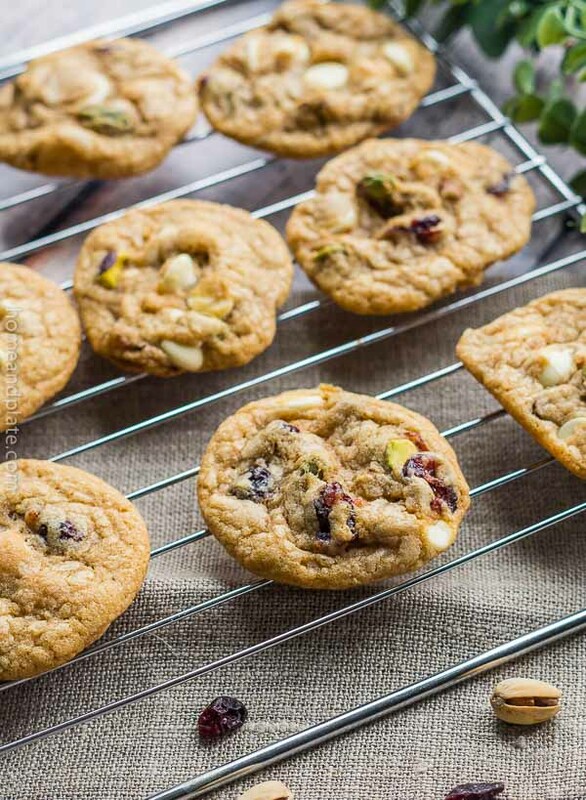 these look fantastic – definitely making these soon! Thanks Kristina…it promise to go quickly so be sure to save a few for yourself if making for a crowd. 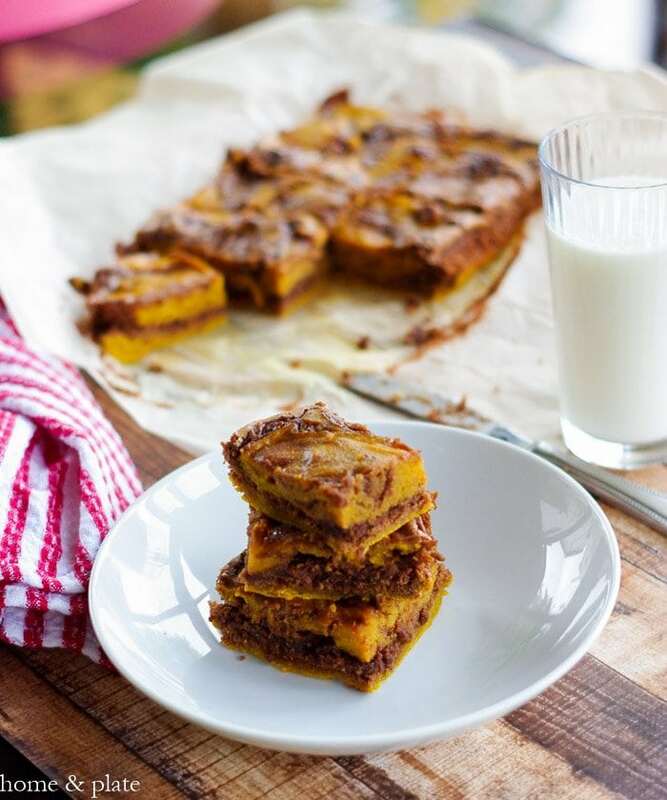 What a yummy beautiful recipe, never thought of a pumpkin brownie but makes so much sense yummo! Thanks Adriana…the pumpkin turns these brownies into something special. These are gorgeous, they sound so good! This is a genius recipe! Already pinned it, but have to share it on another board, too 🙂 I love the use of simple pantry ingredients, I may even have a brownie mix to make it with! Thanks for pinning. This recipe was hit at the swim team kickoff party. I’m sure it will stay a family favorite. The swirls in these are drop dead gorgeous! These look absolutely wonderful!! Thanks so much for the nice compliment. This marbled brownie sounds like the pick me up that I need to feel on top of the world. I have tried marbled cake but never a marbled brownie so I will be sure to follow your recipe and create my own version. Thanks Ana…Such an easy recipe to follow. I hope you like it. It disappeared quickly once I made it. Enjoy!